Digital Endspeed Indicator System The Digital Endspeed Indicator System (DESI) (fig. 4-34) provides a means for measuring the endspeed of the steam catapult shuttle during operation. The endspeed is measured when a shuttle-mounted magnet passes three magnetic sensors mounted in the catapult track near the water break end. The endspeed is digitally displayed for visual readout on a console assembly. In addition, on CVN-68 through CVN-76, a remote readout is provided in the catapult officer console. A thermal printer permanently records this along with other information such as Capacity Selector Valve (CSV) setting, date, time, and shot count. For more detailed information on the DESI installation, refer to technical manual NAVAIR 51-15ABE-2. LUBRICATION SYSTEM LEARNING OBJECTIVES: Describe the components of the lubrication system. Describe the function of the lubrication system. 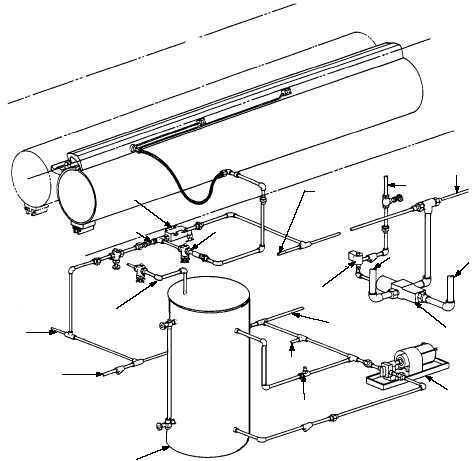 The lubrication system (fig. 4-35) provides a means of lubricating the launching engine cylinder and sealing strip prior to firing the catapult, by injecting lubricating oil through the cylinder covers with a spray pattern that ensures even lubrication of the cylinder walls before passage of the launching engine pistons. The major components of the lubrication system consists of the following: LUBE PUMP MOTOR SET The lube pump motor set delivers lube oil from the lube tank to the lube side of the metering pumps/ injectors. The pump motor is left running continuously during operations. LUBE STORAGE TANK The lube storage tank stores lubricating oil for used during operations. The lube oil tank holds approximately 220 gallons and is located in close proximity to the lube pump. The lube oil tank is piped to the ships lube oil stowage tank, which enables easy and convenient lube oil replenishment. 4-27 METERING PUMP RELIEF VALVE RELIEF VALVE CHECK VALVE LUBE OIL SUPPLY GAUGE LINE LUBE CONTROL VALVE TO OTHER METERING PUMPS TO OTHER METERING PUMPS TO OTHER METERING PUMPS TO OTHER METERING PUMPS LP AIR LUBE AIR SOLENOID LUBE PUMP/MOTOR LUBE TANK TO GRAVITY TANK TO OPPOSITE METERING PUMP ABEf0436 FROM HYD ACCUM- ULATOR Figure 4-35.Lubrication system.